Hello I'm made a service that allows Evernote users to post straight from Evernote editor to Wordpress.com and self hosted Wordpress. A few things to share with you all on this early version. 2. Currently only text is supported. So if you have an image in your Evernote it will not work. When your finished the signup, a new notebook will appear in your evernote. Titled "BlogwithPublish"
Any note written in the notebook will be sync to wordpress. This is great from live blogging. - You would need to use "***bw_published***" tag for your note to be published to your site.
) on how it works. - Some users do not have the **BlogwithPublish Notebook** after signing up. This has been fixed. If you are affected by this, can you help me signup again, you should see the **BlogwithPublish Notebook** in your Evernote account. - I would be updating this service biweekly, so if you have certain features that you like to have, I love to hear about it. Thank you, I'm looking forward to trying this out on a self-hosted site. Do you have images in your roadmap? I clip a lot of graphics and would love to have those show up. I think it does not work. No notebooks created with multiple sign in attempts, no question about which of my blog to connect. Replied you on twitter. Will be adding images in the next update. Caught your post on twitter. What is the page showing? This is the page. But no new notebook. Also dont ask which of my blog to connect. This is excellent -- does exactly what it's supposed to do. Would love to see Evernote tags get carried over to WordPress. Do you think you can help me signup again? I will be sharing the signup process in another post here. Arh Will work on my signup process. Ok. Its the right blog(I still dont understand how you get that information), but what about the "blogwithpublish" notebook which should be added to my evernote notebooks. I think I cant sync my posts without that note book. 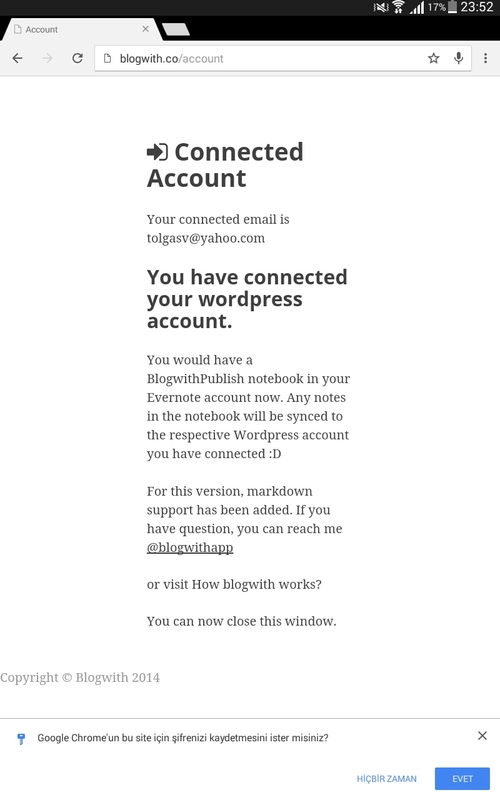 This time, when I try to authorize again, blogwith asks which of my blog to connect. After that wordpress want my authorization. By that authorization "blogwithpublish" book appeared and now its working fine. Thank you bosslee, I was near quitting. Thanks for giving blogwith a second chance. gotten some emails from blogwith users that they have issues signing up.